TP (S-522) is a 62-year-old lady. In March 2013, she told us that she had been coughing for some 3 to 4 months. This developed into severe pain in the arm and back. A GP in her hometown took an X-ray and did a CT scan. It was probably lung cancer. TP went to Singapore for further management. TP did PET scan and MRI followed by a biopsy. The cancer had spread to her bones. For her bones TP had radiation and was given Zometa injection. Biopsy indicated that the tumour was EGFR positive. TP was prescribed Iressa instead of intravenous chemotherapy. Two months on Iressa, blood test showed improvments. Her LDH, CA 125 and CA 15.3 started to decline (table below). TP continued with her Iressa. She barely had coughs. 1. The previously noted lung lesions are less avid compared to the study done on 23 March 2013. 2. The previously noted FDG avid nodes are less avid or resolved. 3. The previously noted FDG avid bone and serosal lesions are less avid or resolved. Overall findings are in keeping with interval partial metabolic response. Indeed after taking Iressa for about 6 months, the results were very impressive. Unfortunately this “good luck” did not last. On the 7th month, late October 2013, TP’s conditions started to deteriorate. She started to cough again, had pain in her chest and her voice became hoarse. Blood test results on 13 January 2014 showed LDH, CA 125 and CA 15.3 had increase to the level much higher than on 23 March 2013 when she was first diagnosed with lung cancer. When you or your loved ones get cancer, you go to the oncologist expecting him/her to cure you! Without doubt the oncologist would prescribe chemo – either as an injection or oral drug. Some patients ask if the treatment could cure them or not. Others take it for granted that the treatment is going to cure them! Perhaps TP is one person who believed or expected that the Iressa which the oncologist prescribed was going to cure her. Why not? The constant chronic coughs that she had almost vanished after taking Iressa. Then the blood test showed “positive” results. PET scan showed the tumours had shrunk and had almost disappeared. Bravo! Time to celebrate! However, there is be NO celebration if you know what can happen next. Barely a month or two after this “celebrated success” the cancer struck back with vengeance. It became worse than she started off when there was no treatment. Is such result or development something out of the norm? No, it is nothing unusual. It happens very often! What does “effective” mean? Whether a cancer treatment is “effective” or not is a matter of definition. The FDA defines an “effective” chemotherapeutic drug as one which achieves a 50% or more reduction in tumor size for 28 days. Only 28 days! In the vast majority of cases, there is absolutely no correlation between shrinking tumors for 28 days and the cure of the cancer or extension of life. When a cancer patient hears the doctor say that chemotherapy is “effective,” he/she thinks that what the doctor really means is that it will cure the cancer. But what really happens is that the chemotherapy merely temporarily shrinks the tumor (usually for only a short period of time), but at the same time, it poisons the cells of the immune system – so that later on (after only a few months to a year), the tumor will start to grow back more viciously and become larger than ever, leading to very poor survival rates. Does it seem cruel to tell a cancer patient that chemotherapy is “effective”, when according to research, it is a known fact that the tumor shrinkage will only be temporary and statistically speaking, the patient has been virtually guaranteed of a much earlier death than if the cancer ran its course without intervention? Is telling a cancer patient that chemotherapy is “effective” really just “good marketing” of the expensive but ineffective chemotherapy drugs? 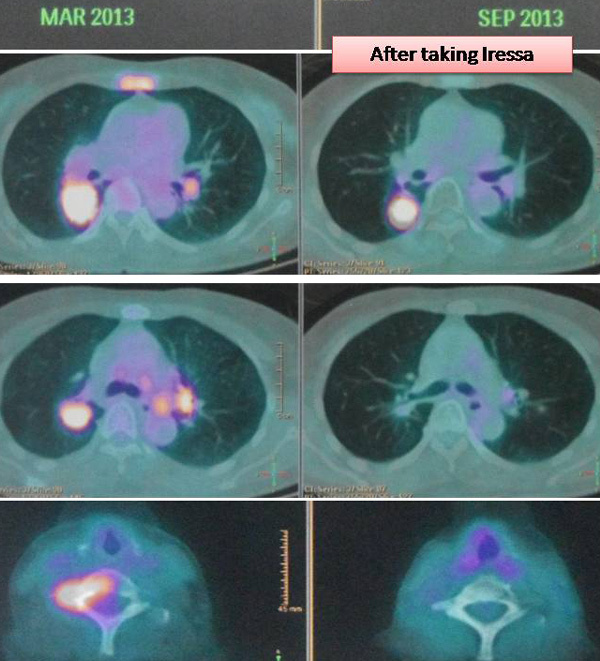 This entry was posted in Lung Cancer and tagged Iressa, lung cancer by CA Care. Bookmark the permalink.